So as Thanksgiving approaches I thought I’d vamp on one of my favorite things. 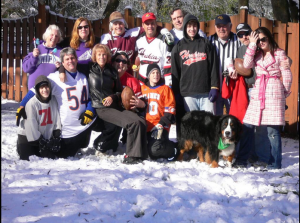 That is the, ever more dangerous, playing of the annual “Turkey bowl” game on thanksgiving morning. First a little history… the game was invented as a cure for the “Wednesday before thanksgiving” hangover as my returning college crew always met up to reconnect and over-achieve at the local pub. A 9 o’clock kick off always seemed like a fine idea at 2 a.m. while the bar is closing. Then the rooster crows and the insanity becomes clear when you pull into the parking lot with rain/sleet/snow, oh and wind, greeting you as your host for the next couple hours. Then you risk your life hopping an 8 foot fence that protects the preferred field, with the added hungover dexterity and grace of chicken suit. Getting the 1/4 barrel of beer over the fence was always an added challenge to add to the fun…but dehydration during sporting events is a real danger. Now you’re on the field, you’ve declared stretching is a myth, and you are ready to dominate. A friendly game of two-hand touch usually (read: always) turns into two-hand shove…which turned into f#$% it, lets play tackle…to “my groin doesn’t work anymore, can we play one hand touch for the second half?” The important thing was, and still is, getting a good sweat on, dishing out payback from last year, and most important, building an appropriate thirst and appetite for the feast to come. This game has been played, by myself, in several of our great states and on foreign soil or terra incognita, if you will. That’s right, we showed the Canadians a thing or two with the “where’s the ball? Fumble-rooskie” They are still pretty hot about that one…pret-ty hot. Now the game stays touch/shove and is played by all able bodies. The nieces have taken their game up a notch with full ‘pillow padding’ PRICELESS (it’s what it sounds like)!